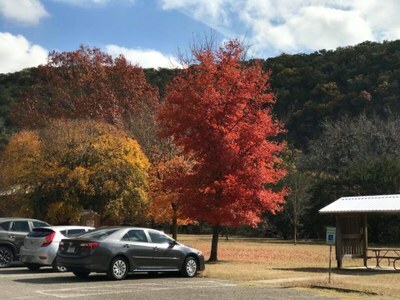 Lost Maples is a designated state natural area. Development is minimal to protect the site's fragile ecosystem. The Headquarters and Interpretive Center building and the attached restrooms are wheelchair accessible (see a 360-view of this area). The park has a designated wheelchair accessible picnic site. The restrooms with showers in the drive-up campsite area are also wheelchair accessible, although the campsites do not meet ADA requirements. Conditions can change quickly. Contact the park for more information and to ask about the status of particular accessible features. Call the Reservation Center to request an accessible campsite (1-800-389-8900).